On Nov. 29, 2012, I presented my latest material on Chiron and Vocation to members and friends of San Francisco Astrological Society (SFAS). For a donation of $10 to SFAS, you can receive both an MP3 audio download of the presentation and a nine-page handout of the slides (four to a page). While it’s always ideal to hear a presentation live because it’s usually different and meatier each time as the material evolves, I am unlikely to travel in 2013. (I will be giving the presentation at home at NCGR-Sacramento Area on Nov. 17 next year.) I wanted to give you this opportunity to access the presentation and donate to a great organization, especially if the chances are that you and your astrology group may never be able to hear me give it in person—or at least not for some time. Does it differ from career? Why is vocation easy for some to find and express, yet difficult for others? How do we mentor vocational passion in ourselves? About midway down the sidebar on the right side, donate $10 using the PayPal button. Then email Linea Astrologer and let her know you just donated $10 for the Chiron and Vocation lecture/slides. She’ll send you the download links. You can also visit the Past Lectures tab on the SFAS home page to order other presentations. They are many and fascinating! If you have local astrology group that would like to hear this material in the future, contact me to discuss. Unless it’s within driving distance of the Sacramento Area, my preference is a lecture/workshop combination where I may also have opportunities to do readings, especially Chiron-specific ones. 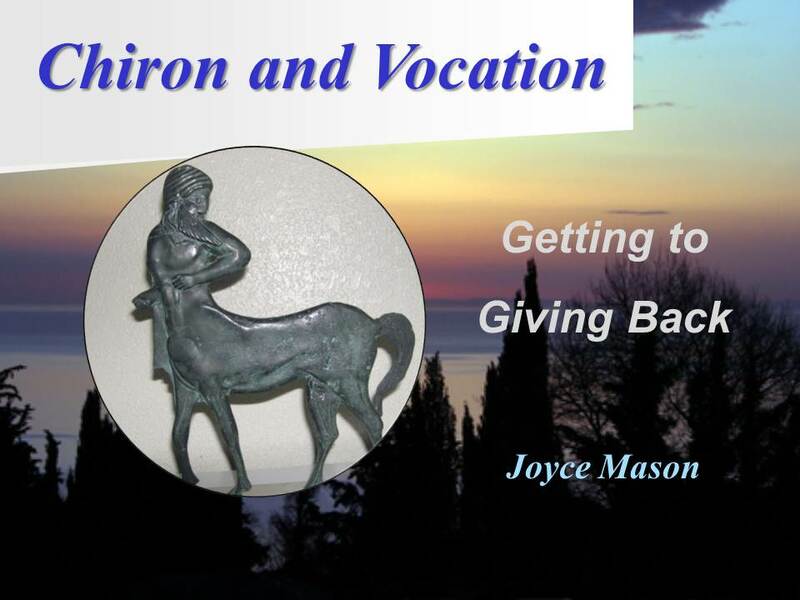 The lecture/workshop combo allows for more digging into your personal placement of Chiron and its impact on your vocation. Every talk can be customized to your particular audience, and much of the learning often comes from our dialogue. My previous article, Chiron and Vocation: Do What You Love and Wholeness Will Follow has many of the core ideas from the San Francisco lecture, but the lecture adds much more. Wishing you a wonderful holiday season and vocational fulfillment all year through!